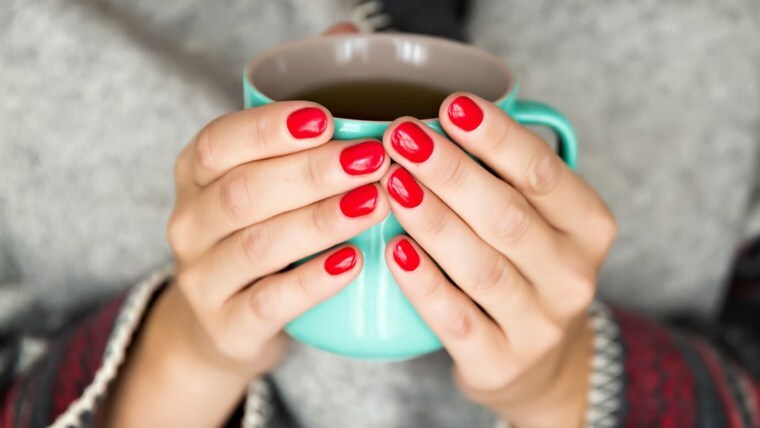 Why do we sabotage our nails with bad habits? We dote on our nails, picking out the perfect polish color and spending a pretty penny to keep them looking beautiful. So why do we also sabotage their looks (and health) with bad habits? We turned to two of the top nail experts in the beauty industry, Katie Jane Hughes, global color ambassador for Butter London, and Jin Soon Choi, celebrity manicurist and founder of JINsoon Nail Polish, to get their take on the poor practices that lead to less-than-pretty hands. Kids and teens aren’t the only ones who struggle with onychophagia — also known as habitual nail biting. Plenty of well-groomed grown-ups are susceptible. Biting obviously makes hands unsightly in the short run, but it can also have longer-term effects, reveals Choi: “If you bite your nails, over time they will be become deformed with bumps and ridges.” Plus, it’s unsanitary. “There’s dirt under your nails,” explains Hughes. “So by biting your nails, you’re effectively eating the dirt” and the bacteria that comes with it. How to break it: Always keep your nails painted. The polish acts as a mild form of aversion therapy, since it tastes bad and visually camouflages the “edible” part of the nail. Investing time and money in professional manicures (even if your nails are really short from biting), may enhance the effect. “You’ll eventually trick yourself into leaving them alone,” says Hughes. If you tend to bite at night, consider a mouth-guard that’s custom-fitted by your dentist. Over time, you’ll break the habit of using your teeth to release stress. Spray-on nail polish: Is it too good to be true? How to break it: Choi’s ingeniously simple solution: Carry pre-moistened nail polish remover packets in your purse for quick removal when you get the urge to pick or peel. “They’re gentle on nails and you can keep them on your person at all times.” Also, to prevent the problem in the first place, maintain your mani as long as possible with a quality top coat. Poor, unwanted cuticles. So many of us pick at them, gnaw at them, cut them and otherwise disrespect their sovereignty. “Cuticles should be left alone because the more you pick at them, the harder it is to stop,” says Hughes. “The habit leaves your cuticles looking ragged and dry,” says Choi, and also leaves you vulnerable to infection. Equally ominous: Recent reports suggesting that damage to cuticle beds causes ridging over time. How to break it: Try topical solutions — using a product to clean up your cuticles instead of scissors, hands or teeth. Hughes advises a cuticle remover to remove offensive dead skin without damaging the healthy nail bed and cuticle you need. How to break it: Choi advises alternating between gel manicures and traditional, polish-based manis as well as moisturizing nails with cuticle oil, especially while sporting gel lacquer. Or, better yet, get the plump, shiny finish you want with one of the new gel-finish polishes. We like Nails Inc. Gel Effect. They were designed just for this reason — to give you the look of gels without the damage. How to break it: Choi advises removing your nail polish when it starts chipping. Same goes for pedicures, which should be removed after two to three weeks. Give your nails a chance to breathe! How to break it: Eat to best support your overall health, including dark, leafy greens and plenty of calcium and magnesium, and drink plenty of water. Also, incorporate gelatin-rich foods into your diet, suggests Hughes. These include chicken soup and, yes, Jell-O. In the meantime, “use a great nail strengthener to give your nails the vitamins they really need,” she advises. Applying cleaning products with bare hands is a major mistake. “Nails swell in water, which leads to chipped nails and weakened nail beds,” cautions Hughes. “Washing detergent can really dry out every single part of your hands and reduce the life our your nail polish,” adds Choi. “Our hands age the quickest because we tend to neglect them the most,” says Choi. This means wrinkles, crepiness and discoloration. “Eventually, you’ll get age spots,” cautions Hughes. How to break it: In the morning, treat your hands to the same sun protection you do your face. And both experts advise carrying portable hand cream with SPF everywhere you go for touch-ups. “It will dramatically change the way your hands look,” says Hughes. Dry, cracked hands are never pretty ... or healthy. “A nice manicure is pointless when your hands are dry,” Hughes advises. “You don't want your hands like crocodile skin,” adds Choi. No, no we do not. This article was originally published May 6, 2014 on TODAY.com.